Change — it’s never easy, yet so often in baseball, it’s necessary. Change was definitely necessary for the 2014 Cardinals with the way this season has gone, and I found myself agreeing with Joe Strauss’s use of the words “complacency and entitlement” at the end of his column today. So, John Mozeliak made changes. Welcome, John Lackey, and goodbye to Allen Craig and Joe Kelly. Allen and Joe are great guys, obviously, who’ve done much for the Cardinals and were definite favorites — I’ve watched Joe since his days with the Quad Cities River Bandits in 2010. But, as fans, we’ll always have our many memories. Here’s a look back to some of those Joe memories in an article I wrote for the 2013 United Cardinal Bloggers publication (still available for only $2.99 at Amazon). Quick, what’s the first thing that comes to mind when you think of Joe Kelly? Is it the post-National Anthem standoff with Scott VanSlyke just before Game Six of the National League Championship Series that garnered him plenty of national attention? Or the ever-popular gif of his dance moves in the outfield during batting practice? Maybe the video bomb of him doing the worm behind Shelby Miller’s interview with Jim Hayes of Fox Sports Midwest? 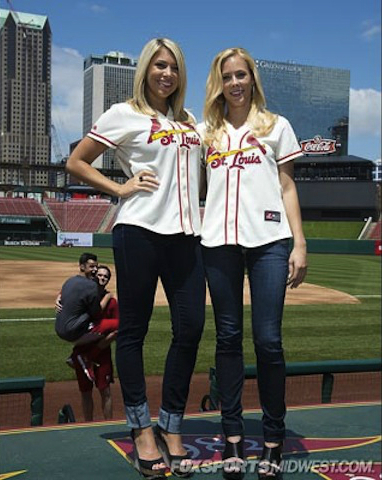 The photobombs in the Fox Sports Midwest girls pictures? Perhaps the letter from his childhood that surfaced this summer, which Joe entertainingly discussed on MLB Network’s “Intentional Talk” during the World Series — the letter in which he predicted he’d be a pitcher when he grew up … and a handsome boy? Possibly that time he donned an old man mask and interviewed Nelly? Of course it actually could be his pitching that comes to mind, especially the way Kelly was such a stopper for a stretch midway through the season when he became part of the rotation in early July after losing out to Shelby Miller during a spring training battle for the fifth spot in the rotation. Because, obviously, were it not for his pitching, we wouldn’t know about Joe Kelly The Entertainer at all. Joe Kelly The Pitcher does take things seriously when he’s on the mound. At least he appears to take it seriously. No funny faces, no winks to the camera. Just throwing, and throwing hard, with a fastball that averaged 95 mph. And his final numbers for 2013 reflect the seriousness. Although those numbers didn’t necessarily start out pretty. He began the season in the bullpen, spending April and May exclusively as a reliever. Given some of those early outings – three runs on four hits including two homers in 1 ⅔ innings against the Diamondbacks in the second game of the season, four runs on three hits and a walk in just one-third of an inning against the Pirates in late April – his ERA and WHIP were not exactly pretty. After those first two months of the season, they stood at 6.75 and 1.98 respectively. Yet once he began starting, his performances improved. His first start was on June 5 against the Diamondbacks and, while the game itself ended up an ugly 10-3 Cardinals loss, his performance was not. Kelly threw 80 pitches, lasted 5 ⅔ innings and gave up two runs total – only one earned – and retired 12 consecutive batters between the second and the sixth. The remainder of June found Joe back in the bullpen, but more successful. Two of those relief appearances, however, were more like starts in length. On June 21, he replaced Tyler Lyons in the second inning after Lyons gave up four runs on three hits with three walks. Kelly stayed in to pitch five scoreless innings with three strikeouts. It was much the same on June 28, as Shelby Miller also lasted only 1 ⅔ innings and gave up five earned runs on six hits in Oakland. Joe pitched 5 ⅓ innings and allowed one run on three hits, and had a 0.96 ERA for June along with an equal 0.96 WHIP. The remainder of the regular season, Kelly was part of the starting rotation – and a valuable one at that. Of his 37 total appearances, 15 of them were starts. And Kelly finished the year with the lowest ERA among all the rotation members, whether using the stats from his starts only – it was 2.28 in those games, with Michael Wacha behind him at 2.83 in his nine starts and Adam Wainwright third with 2.94 – or overall at 2.69. (Wacha is next closest there too, at 2.78 in 15 total games). Wins, of course, are not necessarily a good measure of a pitcher’s effectiveness but they are still an official stat and Kelly did have 10 of them, earning the final one on the last day of the regular season. That made him the fourth member of the Cardinals with double-digit wins behind Wainwright at 19 and Lance Lynn and Shelby Miller at 15 each. Yet there was more to Joe Kelly’s success in 2013 than just becoming part of the rotation and winning games. The big story, for a large stretch, was when he was winning them. Joe became the stopper. Seven of his nine wins as a starter came when the team lost the day before, with many of these coming in July when the Cards went 13-12 and August when they were 16-13 and not exactly tearing up the division. Plus three of those day-after-a-loss victories – Aug. 1, Sept. 1 and Sept. 6 – were against the Pirates when the two teams were battling for the NL Central lead. That disastrous late April performance against the Pirates was a thing of the past by mid-summer. His biggest stop of all came with his Aug. 1 shutout victory against the Pirates that broke the team’s seven-game losing streak. During the stretch, as we really don’t want to recall, the Cards went from leading the division by 2 ½ games to then trailing the Pirates by 1 ½ games. And we particularly don’t want to remember that dreadful five-games-in-four-days series at PNC Park. Well, except the final game. Nothing dreadful about a 13-0 win, plus Kelly had two singles and scored a run. Joe did some of his best pitching this season against the Pirates, particularly in Pittsburgh. During three regular season games and two starts at PNC, he allowed one earned run in 14 innings for a 0.64 ERA and held the Pirates to a .163 batting average. Then, in October, he started Game Three of the National League Division Series there, stepping into the wild and crazed atmosphere of a team playing in the postseason for the first time in 20 years and facing a starter, Francisco Liriano, who had been so dominant at home. He remained calm and cool, even with the crowd chanting his name. He just peered in at Yadier Molina from behind those specs and delivered. Although it was his worst start of the year against the Pirates, it wasn’t as bad as that late April relief outing – he allowed two earned and three runs total, then was let off the hook when Carlos Beltran homered to tie the game in the eighth. Ultimately, the Cardinals lost the game. But that just allowed Michael Wacha to do his thing in Game Four. Kelly made three more starts in October, including Game One of the National League Championship Series against the Los Angeles Dodgers and Game Three of the World Series against the Boston Red Sox – although the end of that game is more memorable than the beginning, with the infamous obstruction walk-off win. Joe wasn’t as effective in October as the rest of the season, compiling a 4.15 ERA in the four starts. Unlike most other members of the Cardinals pitching staff, Joe Kelly doesn’t necessarily have one defining pitching characteristic – no Wainwright curve, no Trevor Rosenthal 100 mph heater, no ground-ball magic like Seth Maness, no electric stuff like Wacha. He doesn’t strike out a lot of guys, he walks a good number, he gives up a lot of hits. His WHIP at the end of the season improved to 1.35, but that was higher than anyone else in the rotation except Jake Westbrook at 1.56. Yet Joe Kelly The Pitcher gets the job done, which is what matters more than anything. He’s both versatile, with 31 starts in his 61 big league appearances, and successful. And, because Joe Kelly The Pitcher gets to be in the big leagues, we get to see Joe Kelly The Entertainer – the team leader in having a good time – again and again. This entry was posted in 2014 Cardinals and tagged 2013 NLCS, Allen Craig, Joe Kelly, Trades by Christine Coleman. Bookmark the permalink.